8 Bedrms + sofa bed(s), trundle, day bed, 3.5 Baths, (Sleeps 18-21). Enjoy the grandeur of this stately 19th Century Colonial Revival home directly across from the Ocean. Only a minute from the front door to an early morning stroll on the beach or a bike ride on the boardwalk, this premier Cape May home has been one family’s summer residence for five generations. Listed as a contributing home on the National Register of Historic Places, the Griscom House offers history, elegance and comfort with all the amenities you would expect. The rooms are large yet intimate and inviting; perfect for bringing family and friends together for fun and memories. 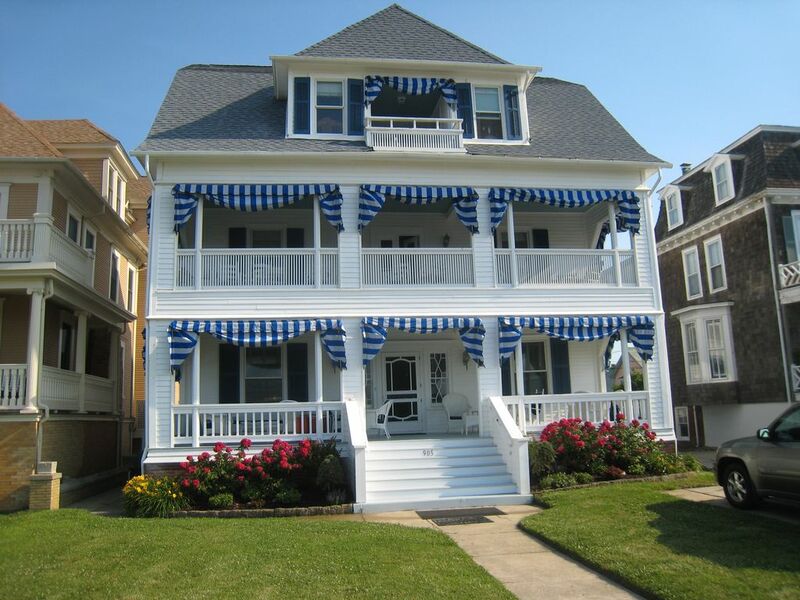 Relax on either of two double wide porches while gazing at panoramic views of the ocean. Enjoy the feel of the cool ocean breezes while you sip your favorite summer drink and watch the dolphins bob by for their daily swim. This summer retreat provides the ideal location...steps to the beach, arcade, movies, and boardwalk shops and nearby restaurants. Only ten minutes on foot to the mall and other great restaurants. The first floor features a spacious central hall and large comfortable living room with seating for a crowd, plus a gas fireplace, a game table, TV, stereo, VCR and DVD player. The fully accessorized kitchen features two large side by side refrigerators with ice makers, a gas range with electric oven for baking, and two dishwashers and garbage disposals. There is a separate laundry room with a washer/dryer and back up storage plus a large second sink for filling lobster pots. A convenient eat-in breakfast room with a separate bar sinks adds to the versatility of the kitchen. The dining room is spacious and grand with comfortable seating for 12 - 14 and room for another table seating 4-5. There is a piano for playing during dessert! Four comfortable and tastefully furnished bedrooms radiate off large center hallways on both the second and third floors with newly renovated baths on each floor plus a 3rd bath that is a charming throw back to the 1890's featuring an antique claw foot tub, plus a modern tiled shower added for convenience. The 2nd floor creates the charming antique feel of yesteryear with its lovely antique furnishings and oriental rugs. The queen bedroom on the right sports an antique four poster canopied bed facing the ocean while across the hall there are two antique four poster twin beds facing the water. This bedroom shares a connecting door with the rose colored king bedroom behind it. You will be lulled gently to sleep while listening to the sounds of the ocean waves lapping at the shore. The third floor with its antique reproduction iron beds and white furniture offers a fresh and breezy beach decor. The ocean front room on the right features extra-long twin beds plus two more singles, for a total of 4 single beds, and is great for teens. There is a queen bed on the oceanfront side, with a daybed and spare trundle mattress underneath. . Across the hall is a queen sized iron bed with a serene ocean view from bed! The fourth bedroom features a queen brass bed. All beds have pillow mattress toppers for maximum sleeping comfort. All bedrooms offer TVs and ceiling fans, in addition to central air and heat. Cape May is one of the country's oldest seaside resorts and encompasses everything a beach resort should have; wide sandy beaches with life guards, extra wide streets and back country roads for biking, boardwalk arcades for the kids, movies, a paradise for bird watchers, outstanding restaurants and so much more. My grandfather purchased this house in 1936 before I was born. I vacationed here with my family in the 1950's, and with my children in the 1990's. As you can imagine, this house has an amazing legacy ... there have been a ton of family celebrations here and lots of memories created by us and all of our repeat renters. We maintain it very well, and love to share it with others. Wonderful location, directly across from the ocean, gorgeous views, close to the center of things, but not commercially congested. Wide covered porches are like extra living space ... just great for hanging out. Primarily residential block of privately owned vacation homes (not investment rental properties) managed with loving care; you are right next to the beach entrance; can walk to the mall in ten minutes; the arcade, ice cream, shops, convention hall, & mini golf are just one block away, several 4 star restaurants are within walking distance. Legacy home with architectural details from another era, heavy moldings, door details, and plaster walls for soundproofing! large gracious dining room, table seats 12, (or more with two at the ends). Also, room for additional table and seating. outside porch on second and third floors with gorgeous ocean views. We arrive to the home from all areas of the tri-state region. We enter this wonderful place filled with charm. It has everything you need to enjoy a restful time with family. Even better, when you just want time alone, you can find a nook inside or outside just to read or watch the dolphins in the ocean. I have traveled often and you just don't find this type of property with such history and charm right next to everything. It is well equipped and the owner is fantastic. You can walk to everything in Cape May and the Beach is right in front of you. Thank you so much, Bryan! We know we are blessed to have this grand old summer home that my grandfather purchased so many years ago and also to have people like you and your family share ithe special Cape May experience that our beachfront home invites! You were a super guest! This house was very spacious and comfortable for my stay in Cape May. The plentiful chairs on the 2nd floor balcony was a perfect way to relax all together as a group, and the view could not be beat! Definitely a great place to stay in Cape May. Beautiful home in an ideal location. The home is absolutely charming, a perfect combination of period Victorian and modern comfort. We found that the house had everything we could need in terms of amenities and household supplies. We could walk to beach shops, coffee, bagels, mini golf, and ice cream. A few from our group enjoyed shopping around Cape May. A great escape - hope to return someday and enjoy that gorgeous front porch again! Thanks so much, Heather. As a first time renter for us, I am so happy you found our house to be so comfortable. I am especially pleased that your said both "period Victorian" and "modern" because that is exactly what we try to attain. I recently did over a bathroom, and opted to have the old marble sink exactly recreated, with plumbing pipes exposed, rather than just go for new. Had to shop around for the right plumber! Our family just returned from a large gathering in Cape May. The Griscom Home housed half of us and it was terrific. The owner is ver nice to deal with and answers all questions immediately. The views from the second and third floors are amazing. CONTACT OWNER TO DISCUSS CANCELLATION AND REFUND POLICY OR REFER TO RENTAL AGREEMENT. SALES TAX: New Jersey requires that sales tax be remitted to the state. This should be sent by separate check prior to check-in, directly to the property owner (not VRBO) who will make the filing(s) to the appropriate taxing authorities. The amount of sales tax will be shown on your lease. sorry .. no prom or graduation parties. Rental deposits are flexible depending on length of stay, time of booking, i.e. summer rentals booked well in advance require 4 deposits of 25% each. Contact owner to discuss payment schedule.